I'll be posting dreamSTATE pieces to the forum here from time-to-time. Scroll to the end for the latest posting - dreamSTATE - Snowdaze a new live performance video. in Toronto, on Dec. 17, 2007 at an Altaira Ambient night - presented by Toronto Noise Promotions. Beautiful piece, Scott. It easily conveys a picture of your description. I'm bummed I didn't get to see the two of you play before I moved west. to balance the vibes out and this is a good reminder. journeyed to play at the PiNG with Embrasing the Glass a few years ago??? That was a sweet set! >to balance the vibes out and this is a good reminder. Cool! Looking forward to hearing it. >journeyed to play at the PiNG with Embracing the Glass a few years ago??? >That was a sweet set! Yessir, it is. Thanks for the compliment - we had a memorable time in a great club with wonderful people. and, to me, has a late-summer, late-night vibe. See how you feel yourself. Mmmmmm... I like this, Scott. I keep getting a picture of someone dreaming peacefully with an "outside" influence trying to get through to the subconscious. That said, it loops very nicely with Dead of Winter. I'm already looking forward to the next piece. The new Buddha Machines - Version 2 have arrived in North America in November. They seem identical to the later V.1 edition but with 9 new loops and a new dial to adjust the loop-speed/pitch. They're in 3 new colours and are at least as Lo-Fi as before). I'm looking forward to spending some time with them. This reminded me that two pieces which had I previously posted here in 2007 were lost in the Hypnos Forum meltdown last year. I've now reactivated the files and hope you'll enjoy these Lo-Fi escapades - each created using real-time mutation of 2 Buddha Machines and later reduced by editing. *A Buddha Machine is a small plastic soundart object/toy designed by Chinese duo FM3 to play their ambient loops. It's very Lo-Fi but is a charming device. 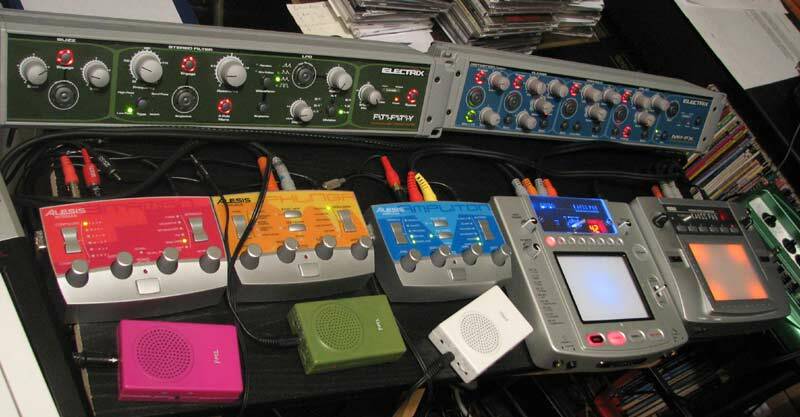 A photo of the gadgets I was manipulating to create the tracks in the previous post. I'll jump in ... Immersion, they are a couple of Korg Kaoss Pads, looks like version 1 and version 2.
ah ok I think Steve Roach did mention he used some of those. But the one I remember is Red and black ? Yes, the most recent Kaoss Pad is black, with a red rim around the pad. I use one of these, and its a very flexible, hands-on piece of gear. Worth checking out at Korg's site. Thanks for fielding the questions Anthony! playing of effects. My favourite delay from the KP1 did not get carried forward to later generations. They're all terrific for live performance - where you can spontaneously transform your sounds. BTW - The KP3 is the strongest as a MIDI-controller if that is also important to you. The problem with live recorded music is that it is no longer live when it is a recording. That must seem like an obvious thing to say and perhaps you completely disagree with me Scott, but listening to live music when it's not played live is a very different experience from listening to live music as it is being played. There's something about being in a room with a lot of people, and experiencing a "performance" where musicians are able to interact with the group. Most bands have sets and play lists so the effect is minimal, but it's often still noticeable. With electronic, free form, abstracter music the effect is far greater though, almost like being outside in nature, part of a group wandering. Yet, and having said that, I really do like listening to your work even if it's a recording. It's obvious you're also wandering while you where playing and not following a predefined path. I say obvious, but that's how it comes across, maybe you DID plan very well (and in that case, very good too). Somehow, the tension of a live performance (where will they go next, where are we now?) comes across well in these samplings. I also like how as one layer of attention and sounds goes away, there is a shimmer of sound behind it...often the point where you fade out the track and I think...ahhh...I wish I was there to hear where they go next. I especially like her_terrain, sounds modern and old at the same time, I really like it. That's a sweet piece of music, Scott. You really are making it tough on those of us who can't get to Toronto to see you all play. uncertain wandering can make the areas where the music all comes together stand higher in the journey of the set. The sharing of the trip changes and charges the experience. Since most AMBiENT PiNG shows aren't in concert venues but in bars and clubs, the experience of each person in the room of the performance will also be different depending on their level of focus at any moment and if they're just letting the music be an environment vs a concert - as per Eno's original definition of ambient music. Therefore, listening to the results is definitely a different experience from being at the performance and perhaps more like photos or videos from the journey. of our own creation along the way or stuck in a key or drone forever! A tempo indicator helps us set up delays/loopers/arpegiators to be synchrosonic and grooving. Something along the lines of: 1) Dark intro (G#m) 10", 2) Atonal 5", 3) Pastoral (A) 10" 4) Groove (Em T80) 10" etc... We'll nudge each other to move along, if required. Although the general "path" is predetermined, I know one hand will often be setting up a fresh sound anticipating a new twist in the flow and we'll end up traveling in a different direction altogether and the scape is abandoned before being birthed. You may not experience that aspect Matthew as my impression is that you might use a single instrument in live performance, while I like to have at least three - so that one can be setup while playing the other two. has been previously edited and uploaded - so I can just describe it and post the link. the chromatic scale. (January C with Wally Jericho, February C# with Kurt Swinghammer...). so, of course, I'd pressed Play instead of Record and the ADATs were blank. who provided additional processing for cheryl from a station in the audience. Scott, I just discovered "Her terrain", and I absolutely love it ! Warm and deep, I am fond of this type of sound... Thanks for sharing it !